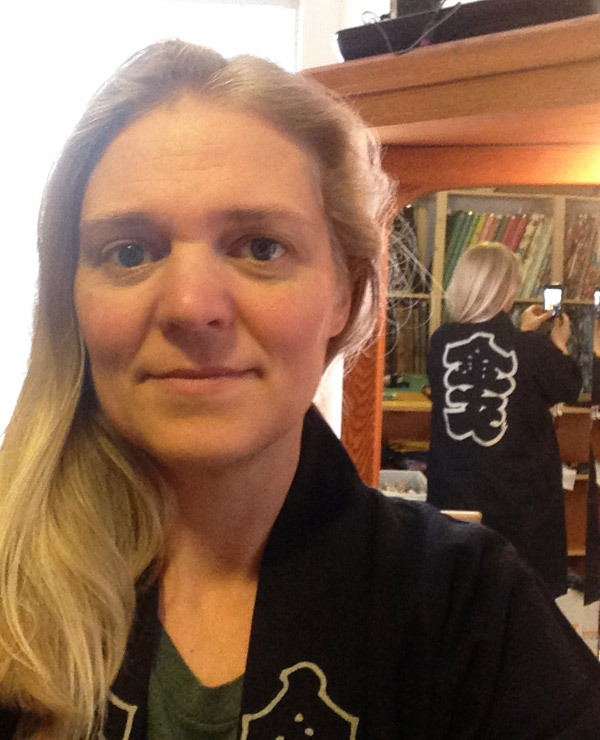 … Mainly because Tuesdays don’t always work for me, but I do enjoy wearing kimono at least once a week. So! Let’s catch up. Springtime in Northern California is back-and-forth, warm then cold again, rainy and cool, rainy and warm, dry and warm, dry and cold, and we all get confused. The sun is shining, then it isn’t. It’s too early for the fog that will make our summer tourists shiver, and a few glorious days of over 70°F (21°C) weather (let’s go plant things in the garden!) followed by overcast and cold (the things I planted aren’t happy) are not unusual. I’ve tried to stick to the traditional kimono schedule of what to wear when, but it isn’t practical here. 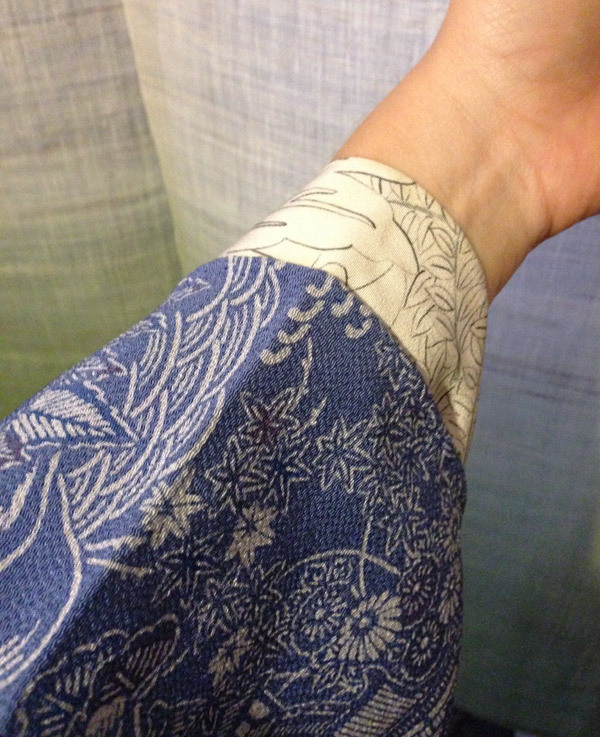 Some days are hot enough for bare feet and yukata, but those days might be followed by a return to tabi and layers of silk. A lot of the time I bustle about the studio in a vintage indigo happi coat over a t-shirt and jeans because it’s easy to wear and just warm enough. The last time I dug into my kimono collection for something to wear I pulled out a drapey-soft blue hitoe (unlined) chirimen komon kimono. Casual enough for daily wear but nice enough for visiting. Once again I went for a simple hanhaba obi as I’m too lazy to bother with a nagoya obi while I’m working and the idea of coordinating obi, obijime, obiage, and messing around with an obimakura gives me a headache. It sounds so simplistic when we describe an obi as a “kimono sash” in Western parlance. It was just a “sash” long ago, but now it’s a major feature in a kimono wearer’s wardrobe. Considering how many more formal obi I own, I may have to rethink my aversion to wearing them just so I can justify all the space they take up on my shelves. 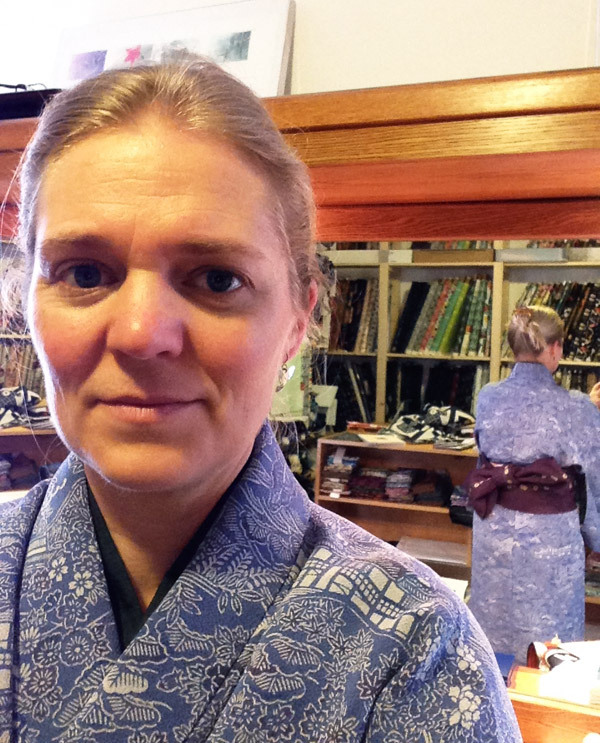 This kimono is a bit small for me–which is saying something as I’m only 5′ 2″ (157cm)–and the juban I was wearing stuck out at the cuff. That’s reason #1 why I didn’t venture out of the house while wearing it. Reason #2 was that my daughter insisted I was only going to embarrass her again. That’s what parents are for, right?